Back to blogging, wow. Things have changed! Still needling away, projects galore, and a new passion---art journaling! 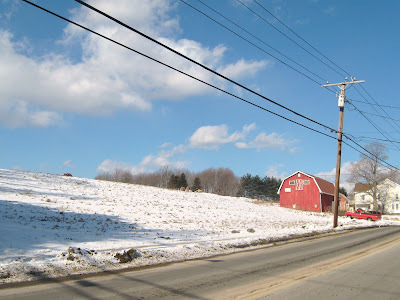 This street leads to my house, and I love this barn scene..here we are, after a light snowfall. Last week was the biggie! Happy New Year to all! When I have extra time and I don't feel like stitching, I wander the web sometimes aimlessly and sometimes not so aimlessly. 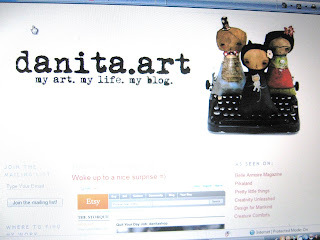 Today, I came upon Danita Art, by clicking link after link after link after link, etc.This is an outstanding blog! Her work is so unique and beautiful. I love the colors she uses and her dolls, art prints, even ornaments are sweet as ever. She is even doing a giveaway, (quick, drawing is Jan, 1...) so visit her blog and have a look for yourself. I really, really enjoy her work. You know when something strikes a cord deep within you, well Danita's art has this effect on me. Maybe because alot of her dolls have black hair like me? lol !
? another try at larger pictures ? The best I can do...lol. Thanks to all who visit my blog and left comments for the giveaways, here are the winners! I have tried desperately to upload the random.org pictures all in one post to no avail, so here are the list of winners and each random.org picture in its own post will follow. Last up for the great giveaway (this is much more fun than I thought it would be...ha!) 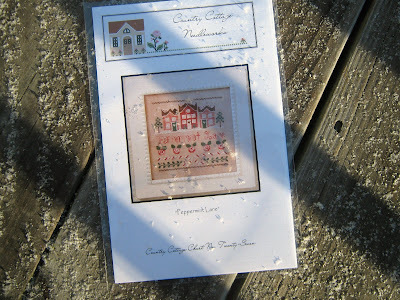 is Just Cross Stitch December 2008 issue with a beautiful piece of 32 count Belgium linen in 'Oyster' measuring 20"x27" (51 cm x 69 cm), great for a big project for many small ornaments, or a few medium sized projects. Those of you who dye your own fabrics, if you win this and decide to dye it, I'd love to see what you come up with. If you'd like to win this giveaway, please leave a comment with your desire to win and an email where I can reach you. All winners will be chosen on Friday 12/19/08. If when I have picked winners and posted them here on my blog, and they don't respond within a week, the runner up will be selected the winner. Best wishes and good luck! 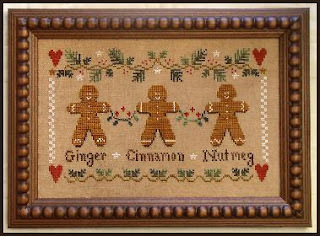 Third up for a giveaway is LHN's 'Gingerbread Trio' (chart only). I bought several of these as gifts for stitchers who are great bakers as well, and here is one for you if you are the lucky one! If you would like to win this chart, please leave a comment with your desire to win and an email where I can reach you. The winner will be announced on 12/19/08, Friday, using Random.org list randomizer. Good luck! Here is the second of my 4 giveaways: a truely beautiful DVD. If you have not seen this, then you need to, and if you've seen it, you know what I mean. Why not enter to win it and give it as a gift you someone you love? If you would like to win this giveaway, please respond by leaving a comment with your desire to win it and an email where I can reach you. I will use random.org list randomizer for obtaining a winner who will be announced on Friday 12/19/08. Best Wishes! Greetings stitchers! As promised, I will have several giveaways, this being the first. Better late than never, lol! I'm soooo behind on everything, LOL! There will be 4 different posts, each containing a gift, so please if you want to enter your name in all 4, please respond to each of the 4 by leaving a comment with your desire to win and email where I may reach you. All names will be picked and announced on 12/19/08 (Friday). Yes, it's real snow, so pretty. So if you are interested in winning this chart in this giveaway, please post a comment alluding to this and leave an email where you can be reached. Names will be taken until 12/19/08 Friday. Then I'll use the wonderful random.org list randomizer to get us a winner! Something Wicked by one of my favorite designing companies: La-D-Da. Mercy has had several giveaways and I was one of her lucky winners! She even kitted it up for me with the recommended fabric and DMC threads. I just love this design, thanks so much Mercy! 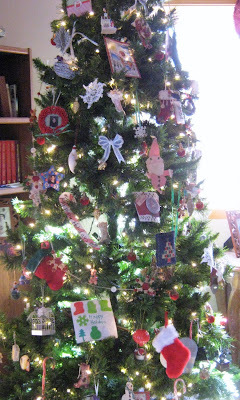 Because I have been the recipient of two of the most lovely giveaways, I too, shall enter the giveaway extravaganza. Not in honor of anything or anyone in particular, but rather for the sake of doing something 'nice' and to show my appreciation for the generosity of the stitchers who have given of themselves so selflessly and abundantly. Another Fair & Square Exchange received! 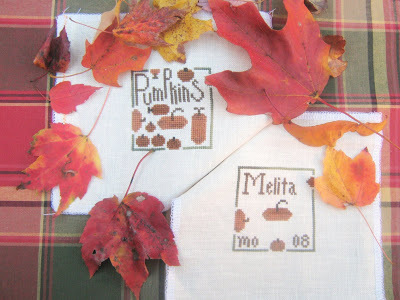 I received these adorable squares for the Autumn Round from my Fair & Square Friendship Exchange partner, Melita. I love the little pumpkins, thank you, Melita! Carolyn, of Taking one stitch at a time, ran a contest not too long ago, and guess what?! I won!!!! Simply by leaving a comment on her contest post. I am so thrilled and honored, and guess what I won? 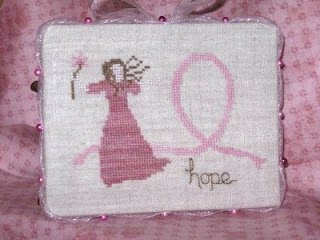 I won this beautiful 2007 Full of Hope Pinkeep Kit by MaryKathryn of eHandcrafts Stitching Room. Join an Army of Women! I have registered as a volunteer and proudly display the Army of Women logo on my blog! More squares, more contests on Stitch Pink! SueW received the squares I stitched for her for Round #9 of the Fair & Square Friendship Exchange. I choose 32 count antique white linen and stitched with Anchor thread # 148 --2/2. It is a motif from an AMAP design with an added phrase dreamed up by yours truly and a little pair off scissors dangling off the 'S' stitched 1/1. A little heart on both the signature square and main square and waalaa! 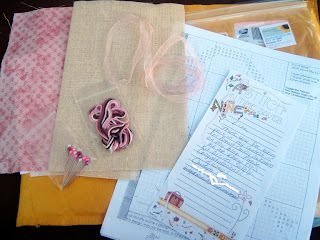 Here is a nifty little necklace and wallet offered in one contest on the Stitch Pink Blog <-----please click the link and visit this great site and readwhat Stitch Pink is all about. and leave a comment if you would like to win either of these wonderful gifts in honor of breast cancer awareness month. I recently joined the Stitch Pink Blog and proudly display the logo on my own blog. It's a wonderful feeling being a part of this special online stitching community. Thanks to Meari for her helping me get in touch with Kim and thanks to Kim for making me a member of the Stitch Pink blog. Gentle reminder, don't forget your mammograms and self breast exams. Not too long ago (back in August, lol), I was awarded the 'I Love Your Blog' Award by my friend, Dawn. Thank you, Dawn. I also love your blog and quite a few (lol) others. 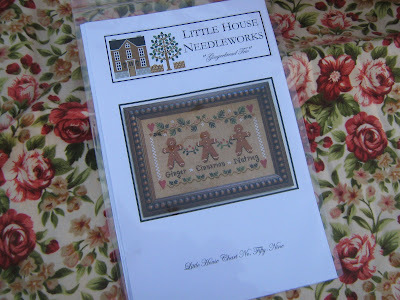 Every single blogger from the Fair & Square Friendship Exchange is awarded this as well because I have enjoyed and spent many an hour viewing their stitching and reading. 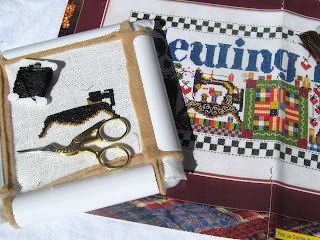 Crafting Cloth Dolls by Gourley, a wonderful author and dollmaker: the patterns in the book do not require enlarging, and the instructions are quite easy, even for the beginner. Sew Pretty Christmas HomeStyle, a Tilda book: I love pink and red, and she has over 35 crafts to make and the patterns in this book also do not need enlarging. There are pigs, geese, pixie dolls, angels, hearts, birds, etc...all things I love and I especially like that she doesn't rely on the traditional red and green for Christmas. 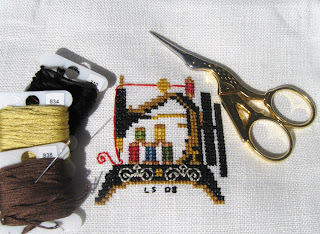 The Sampler Motif Book by Brenda Keyes: this book is chock full of motifs and samplers and ideas for finishing techniques. The best thing aside from the designs in this book is that I got it from PaperbackSwap.com basically for FREE! Cost me 1 credit, ha! Lacy Crochet by Shufu-To-Seikatsu Sha: I was raised sewing and crocheting at my grandmother's knee, and although cross-stitching is my favorite type of needlework, crochet is right up there. The very best thing about this book is that instead of written crochet instructions the author uses diagrammatic instructions. 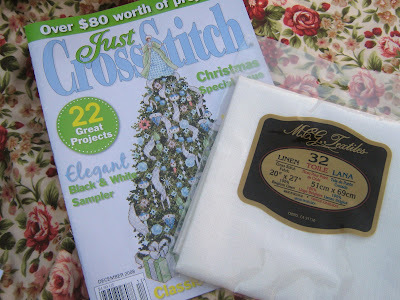 Fair & Square Exchange from Sue W! What do you think, trivial, or a neat little trick? 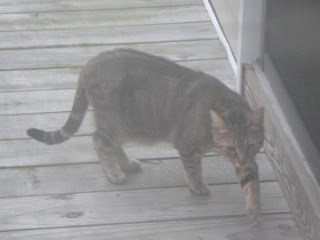 The other day as I was doing dishes, yes, by hand, lol , I spied this little prowler at our back slider door! 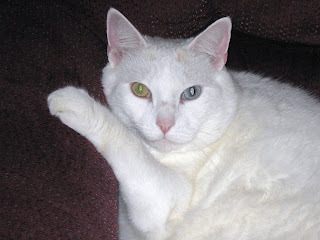 Marshmallow was napping, and as soon as he (Marsh) spotted this kitty he jumped off his chair and ran the intruder down the back stairs and all the way out the the edge of the property near the stream, and the two of them had a mewling and posturing match for about 1/2 an hour, lol. This is a smallish neighborhood and we all know each other and each others pets, but even though this little one had a collar, no one seems to know who s/he is. Pillow finish and some sweet finds! Meet 'Ellie', rescued from a local thrift shop. She is an adolescent bunny who looks like she was either made in hurry, or perhaps by a child. She isn't stuffed tightly and her clothing is sort of haphazard. But, because she is who she is ( a bunny), she was rescued and added to the ever growing bunny colony in my home, which I *will* take pictures of at some point. Oh, Ellie was .50 cents, lol. Imagine? 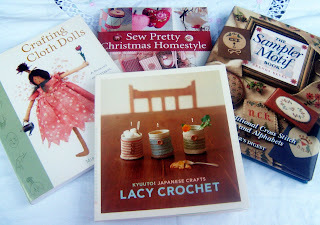 Below are a few sweet finds which I added to my crafting/stitching stash of goodies. 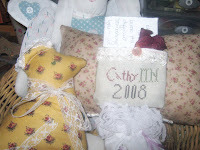 The stitching (La D Da's-A Rose is a Rose- a freebie design) on the pillow in the picture with Ellie was done by CathyB, my first Fair and Square Exchange partner. Since I am in a finishing technique mode, and being the pillow enthusiast that I am---I made it into a little pillow-- the fabric is a cotton calico with little roses on it and the trim is some that Lillie sent me as a PIF. It works perfectly! And the back: I sewed a little pocket out of the signature square CathyB stitched, trimmed it, added a pearly button, laminated the note she sent, and added one of my own dried roses. The chicken on the left is something I sewed a few months back from a pattern I found in a 1980's craft mag that was free from the library. A cute little design rescued from a local thrift shop for .50 cents! Appears that it was stitched on muslin free hand in cross stitch. Unfortunately no date or location, but precious just the same. Another find for my bunnies and/or dolls (now that I think of it, even some stitching), for a whopping .50 cents! This is a piece I stitched about a year ago, and could never decide on a finishing technique. It's called 'With the Heart' a Whimsey & Wit design. Being in a finishing technique mode, I made it into a pillow, but a hanging pillow using a heart shaped wire the I removed from something else, so I suppose it's partly recycled. The fabric on the back is a checkered homespun exactly like the fabric trim in the picture below. I used off white cotton lace, fabric homespun trim, antique buttons, and a silver dangling heart on the right side of it for fun. I'm very happy with the way it came out. (click on picture to make image larger). 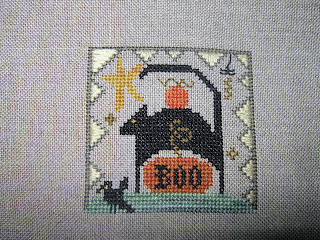 Yesterday I received my Halloween Round 2008 squares from my Fair & Square Exchange from my partner Paula C: imagine my surprise when I opened the envelope to find that we stitched the exact same design for each other using basically the same fabric and threads! I absolutely love them, Paula, thank you! The leaf is from our front yard. Here's what I stitched for Paula: with, of course, a signature square. Seems we both were crazy about the design perhaps another type of exchange like 'stitch the same thing for another stitcher' is in order, lol. No one tagged me for this, but in my blog sojourns I came across it on Michele B's blog and thought it would be fun to do the one-word answer questionnaire ( I also altered the rule a bit by adding that you answer with whatever comes into your mind first), then I'm off to stitch and watch movies "Mothman Prophecies" and "Vampires". Try this it's quite fun. by my Fair and Square Exchange partner, Melita. I'm so glad to know she loves them. They were a fun and easy stitch. 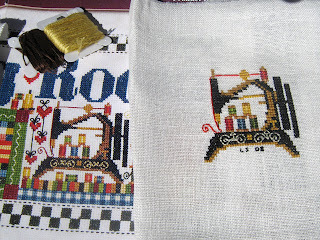 A small design by Brightneedle, stitched on 32 count antique white linen using cotton DMC threads. I especially like the little leaves on the tree, and the little girl, oh so cute! Melita said she will finish the squares into a cube. A Wee Finish and WIP! 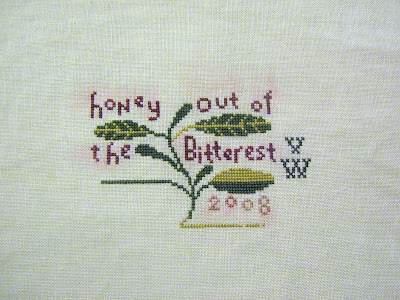 From Country Cross Stitch Magazine, October 2008 issue. 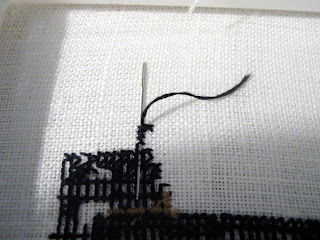 I stitched a motif from a larger design on 32 count linen using cotton DMC threads 2/2. Below is the picture from the mag next to my stitched piece. Oh, note to Meari, these are the 6 x 6 q-snaps, the design size is 40 or so stitches by 50 or so stitches. I doubled up on the felt because the linen is thin. 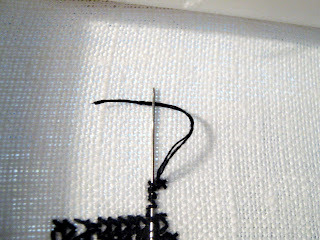 I love using the 6 x 6 q-snaps for this size project, the only drawback is when you get to the ends of the design when ending or starting a new thread, you may have to slide the clamp off the q-snap to allow the needle to pass straight under the existing stitches so as not to disturb them and loosen them too much. I left about 2 inches around the design size for finishing and to lay over the q-snap so the clamp can hug it properly and securely. Look how puffy he is, lol. 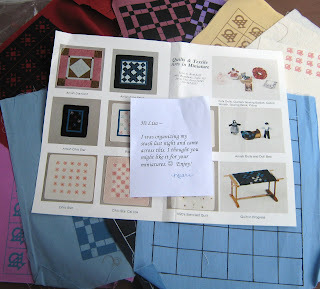 ...squares that I stitched for my partner, Paula C were received, and she loves them! The design is from the JCS Halloween issue. I just loved stitching that weird cat. Stitched on 32 count raw linen using silk, GAST and DMC threads. I'm not a big satin stitch fan, but these didn't come out so bad afterall, lol. The Fair and Square Friendship Exchange blog can be found here. My sweet friend, Dawn, received the lil kitty and beaded fob I made for her. 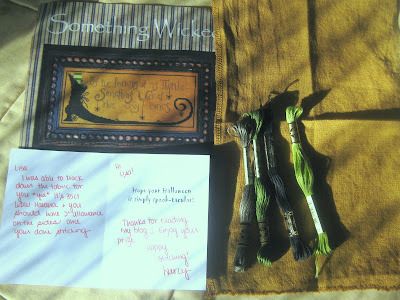 It is such a joy for me to make sentimental little things for my special friends. I also made her a card which can be seen here. I scanned the finished gift onto cardstock paper using the magazine page as background, ripped the edges added "pawprints", and a few remnants of materials used. I used a cute pattern from a 1998 Leisure Arts magazine to sew the kitty (gingham and denim) and stitched a little kitty playing with yarn on it's body (32 count linen). The buttons are from my grandmother's collection. Ribbon and a couple of beads as embellishment, and kitty was complete. I love the effect. My sweet friend, Meari, known to most of us in our online stitching community sent me these adorable miniature quilt supplies. What a thoughtful thing to do. Thank you , Meari! Andrea- (prounounced Ondrea, not ANDrea) Deep Fried Cupcake- who is new to me and we share so many interests: she stitched Fishes and Bait, BitterFlower Sampler, likes bunnies and is an avid reader with a great wishlist of books. Her pugs are incredibly cute! "Hi, Andrea!" Donnasews- who is also new to me. 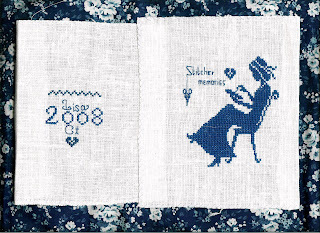 She loves samplers and has done some gorgeous stitching. 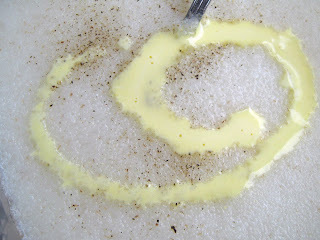 I am not sure how I came across her blog called Simpler Times. I feel so at home there with pictures of her kitty, baking, and quilts. "Hi Donna!" 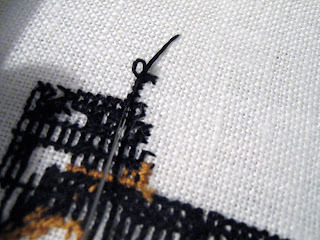 A Stitch In Time-Tammie-stitcher who is new to me. 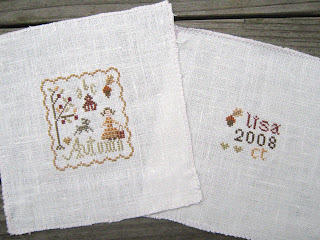 Her blog has lots of pictures of her children and stitching. Her post regarding PIF's and RAK's made me think about how we as an online stitching community can make newer members feel more a part of things, I'm still thinking (this may take awhile, lol), but I wanted to recognize her on my blog because her post touched me and made me think. "Hi Tammie!" 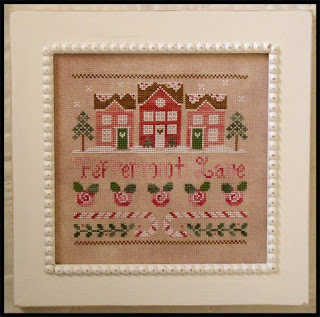 Anne S-not new to me, but as busy as she is continues to provide us with the Focus on Finishing blog with tons of contributions from stitchers from all over the world chock full of complimentary tutorials. "Hi Anne!" 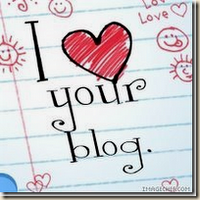 Ladies, thank you all for your blogs & sharing. I am always admonishing my family and visitors to not drink or eat near my needlework...and who is the one that spilled diet pepsi on my BOF Bitterflower Sampler WIP? Umm, yea...me! So, immediately after it happened, I took the piece(s), (yes more than one was affected, grrr) off their q-snaps and immediately ran cold water over the areas that were already becoming stained....above is the BOF Bitterflower Sampler...and the GAST have bled. So here are my choices: restitch the entire thing, continue stitching, and when finished, just immerse the whole thing in cold water to get the same 'bled' effect overall. (You know, when you get lemons, make lemonade instead of cursing the whole thing, lol). You know, I am not really all that upset over this, just that it's an inconvenience that made me stop the whole stitching process. I love this design, the mermaid is my favorite part! 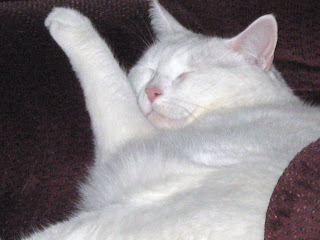 Lisa lives a quiet contented life with her extended family. She finds joy, peace and balance in caring for others, cooking, creating and music. Her interests include incessant reading, word games, stitching and sewing, crocheting, and serial killers/true crime. Lisa is new to art journaling.